50 to 1: Those are the odds that a contestant will become Australia’s next Masterchef. As the season marches relentlessly on, the odds improve but the standards get tougher, the challenges increasingly impossible. The weak (or often the merely unlucky) are ruthlessly weeded out; amateur pastry chefs and makers of homemade pasta begin to disappear from your screen, their smiling, hopeful faces in the opening sequence the only reminder that they were ever there at all. Audiences all over the world have thrilled to the spectacle, backing their chosen culinary gladiators and their favourite team, episode after episode. Until, at the very end, only one is left standing to claim the title and the glory – ahead of them the career they’ve fought with heart and soul to claim, a chance to publish their own cookery book and $100,000 in cash to fund their vision. Season 4 will begin airing on local cable on June 14. What’s in store? “Lots of surprises, and I bet it will be even bigger, but I can’t imagine how they are going to top last season’s line up of world chefs,” says Sri Lankan-born, Season 3 contestant Kumar Pereira. It’s the same question all the fans are asking. (Once you’ve cooked for the Dalai Lama and Nigella Lawson, you might have nowhere to go but down.) The celebrity line-up is one of the great draws of the show – with master classes and a range of new culinary experiences leaving contestants measurably more impressive cooks by the end of their ordeal. For his part, though Kumar didn’t get to light up a stove with Nigella, he says he still spent plenty of time being star struck. The rewards multiply the further you get. If you’re one of those lucky enough to make it to the top 8 in the show, a much anticipated international jaunt awaits. Contestants in previous seasons have travelled to Hong Kong, London and New York, but competition-related field trips aside, contestants spend the rest of their time effectively under house arrest – “there’s no leaving the house or talking to anyone,” says Kumar. “There are no calls other than the weekly call.” Aside from that 10 minute conversation with their families, participants have no access to internet, T.V or their cell phones – violate the rules and you’re asked to leave. Still, the top 24 know they’ve really arrived when they finally walk through the doors of the Masterchef house. 4 stories tall, the house’s prime location places it in the Eastern suburbs of Sydney, says Kumar. Its windows open out onto a lovely view of the harbour and a swimming pool – and depending on how well they do, this could be ‘home’ for many months. Afforded a modest stipend, participants are also asked to take charge of their own cooking and cleaning (and this includes taking turns scrubbing out the 11 fridges in the house) for the duration of their stay. The cameras even follow them here and so it’s no surprise they become quickly accustomed to being filmed. The pressure cooker environment allows contestants to form strong bonds with each other…and with their audience. The show has won millions of viewers over by offering not just a rollercoaster ride of a competition but an extraordinary wholesomeness unusual in reality television, both traits which have already been dramatically highlighted in the new season. The contestants, who you get to know through succinct, confessional style video clips introducing them, their families and why they love food, have a rare camaraderie as a group. Tweaks in the Season 4 format, such as a new team centric approach to the celebrity immunity challenge cook-offs seem set to simply strengthen the bonds between them. “It was difficult and strange initially, as there were such diverse age groups,” says Kumar, who remembers that in their case there were people from 20 through to 60 years competing. “The common denominator of cooking was what caused bonding…It wasn’t easy sharing the same space but we found our safety valves and spaces that kept us sane…” Of course, their confinement left them plenty of time to practise in the house’s two kitchens. The steep learning curve the process encourages will stay the same for the contestants facing off on Season 4. It’s immediately evident that standards are higher than they were in previous seasons. The show also looks set to be more inclusive and diverse than before – contestants include the likes of young Amina Elshafei whose mixed Egyptian-Korean heritage has her drawing from an unusual palette of flavours even while her adherence to her Muslim faith means that when she inevitably has to cook with pork, she won’t be tasting her dish. 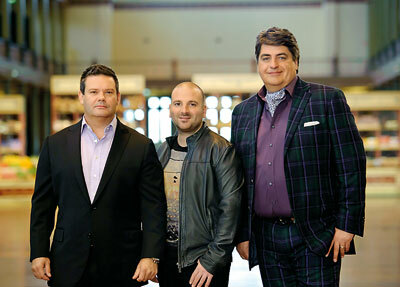 In the past, Masterchef judges – chefs George Calombaris and Gary Mehigan and food critic Matt Preston – have heaped praise on contestants like Jimmy Seervai and Poh Ling Yeow when they cooked recipes that drew on their culinary heritage. Kumar chose not to do the same – did it cost him? “Probably, but I was true to myself and did what I like to cook – I refuse to conform to the expectations of others,” says Kumar, who faltered only after making it into the top 12. Published in the Sunday Times on June 11, 2012. Words by Smriti Daniel. Pix courtesy Masterchef Australia. Tags: Australia's popular cooking show returns for its fourth season. Bookmark the permalink.